While many home buyers at an open house focus their time assessing the layout of the rooms and the brands of the kitchen appliances, smart buyers know the things that are really important to look for when buying a home. Think of the open house as a first date: It’s an opportunity to look beyond the pictures you saw online and figure out if the property is worth seeing again — or if you should move on and never look back. Don’t let those freshly baked cookies or potpourri simmering on the stove fool you. The more aggressive the scent, the greater the likelihood the seller is taking precautions to mask a more offensive odor. Take a deep whiff in every room you enter, and look closely at walls, ceilings, and flooring for signs of pet accidents, mildew or smoke. Be sure to inspect the tile in kitchens and bathrooms. If the gaps or tiles are slightly uneven, it may indicate a DIY job. Lazy or unskilled tiling could indicate that multiple fixes might have been done on the fly, which can add up to big bucks in potential repair costs. When you walk through a home, be on the lookout for signs that the owner might have neglected routine home maintenance. Take note of issues such as burned-out lightbulbs, rotted trim, leaky faucets or faded paint. These signs indicate the seller may have ignored other ongoing home maintenance tasks that can cause real problems down the road. An attentive homeowner is focused on tasks like flushing the water heater annually, changing air filters monthly, cleaning the chimney, inspecting the roof for leaks, and regularly re-caulking around windows and doors, for example, to keep all those systems in good working order. That creek might look picturesque now, but it won’t when it comes cascading through your back door. In New England, rain and snow is a given, so it’s vital to consider the possibility of flooding. Being uninsured against flood risk can create giant damage bills on a regular basis. Take a second to pull back the curtains to check for lopsided frames, and then give the windows a tug to make sure they slide easily. If they stick, it could be a sign of foundation issues (as noted above) or just poor installation. Neither is good. The only fix — and it’s an expensive one — are new windows. To detect possible signs of mold while wandering through an open house, discreetly open bathroom and sink cabinets to take a look around water pipes or drains. Even small black or gray spots indicate that more serious issues may be lurking. You can also check the caulking around faucets and tubs for black spots and look for patches on the ceiling. A musty odor can indicate water damage, even if you don’t see standing water. Check walls and ceilings for water lines; they likely indicate flooding from a leak or a burst pipe that may have caused internal damage. Also, take a peek at exposed piping in basements or laundry rooms and check for rust, water stains or leaking. While most realtors will recommend a fresh coat of paint before putting your home on the market, be wary. That one freshly painted wall could be an accent wall -- or it could be hiding something, like a patch of mold. Rugs can also be used to cover damage. Don’t be afraid to lift up area rugs to check hardwood flooring. Look at the underneath to make sure they’re not stained or damaged by pets. Without adequate interior ventilation, moisture sticks around, which can create mold and increase allergies. The tipoff: Condensation on windows or slightly bubbled or peeling paint around windows, doors or vents. Either can indicate moisture in the walls and ceiling drywall. The bottom line: Don’t walk through an open house the way you walk through a museum. 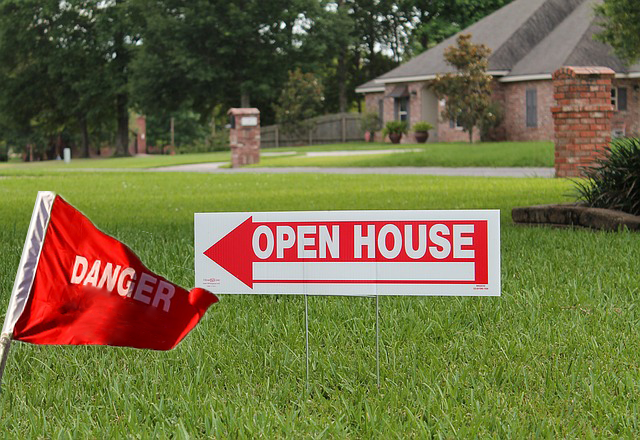 Even though your home inspector is likely to detect many of these problems down the line, being attentive to these red flags in an open house ensures that you’re not wasting your time on a home that isn’t the one for you. See a listing of our upcoming open houses, or feel free to contact us with any questions about your home or one you're considering buying. We're happy to help.